While Twitter is getting a lot of attention in the current Iranian crisis, it’s good to know that the robust Iranian blogosphere also remains active in the face of the government’s interference with the Internet. The figure below shows new blog posts on blogfa.com, the dominant Iranian blogging platform, over the past three weeks. While some Blogfa users are outside Iran, the vast majority are inside. 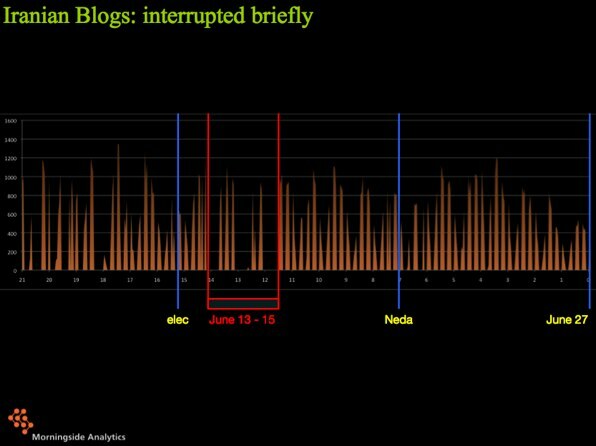 We can see significant, through sporadic, disruption of Iranian blogging for a period of about two and a half days beginning a day after the disputed election. After that, posting returns to roughly pre-election levels. What are bloggers talking about? A scan of text reveals high levels of discussion about politics. Many bloggers continue to link to websites supporting Mousavi (such as mirhussein.com), whereas linking to the main site supporting Ahmadinejad emtedadmehr.com) has nearly stopped, including among conservative political bloggers. * From 7 June 2009 until the time of publication (26 June 2009), we have recorded 2,024,166 tweets about the election in Iran. * Approximately 480,000 users have contributed to this conversation alone. * 59.3% of users tweet just once, and these users contribute 14.1% of the total number. * The top 10% of users in our study account for 65.5% of total tweets. 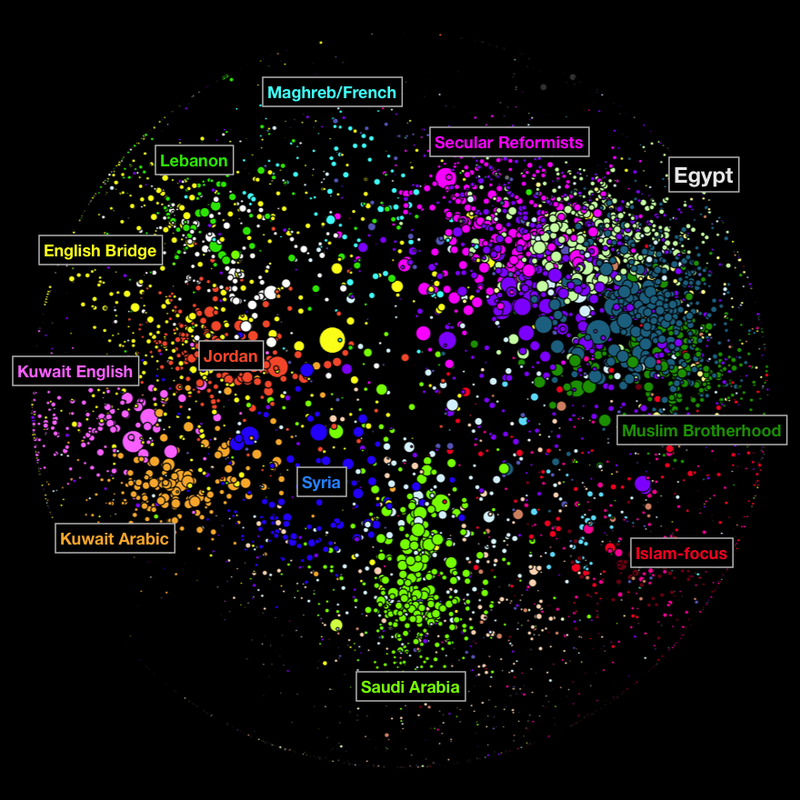 * 1 in 4 tweets about Iran is a retweet of another user’s content. You can download the full PDF report here. After all, it appears that people living under authoritarian regimes such as the one in Iran are as addicted to the Internet as the rest of us are. Even though states push back, they can’t keep the Internet down for long without serious blowback from their citizens. Iranian officials have the power to shutter the Internet just as they once clamped down on reformist newspapers, but they may be more concerned now about any move that pushes those watching — or blogging or tweeting — from the sidelines into the throngs of protesters already in the streets. The Internet and mobile phones have taken on a major role in Iranian politics over the last several months. As protests over the contested election results continue in Iran, the government has dramatically increased its control over digital technologies. Many important Web sites have been blocked over the past couple of days, including the Web sites of the opposition parties in Iran, Facebook, Twitter, and YouTube. While political organizers have learned to leverage the organizing power of Web 2.0 tools, government censors in Iran are quick to shut them down when they are most effective. None of this is surprising; it reflects similar events seen in many places around the world. Digital tools have been shown to be effective political organizing tools, from the Obama presidential campaign in the US to Ukraine, Colombia and Moldova. As powerful as new technologies may be as political tools, information and communication technologies have also been proven to be exceedingly fragile; in countries where the government has sufficient latitude to interfere with the use of these tools, they are easily disrupted and if necessary, can be shut down entirely. The role of information and communication technologies in Iranian politics has matured rapidly over the past year. Political opposition groups in particular have adopted new online and mobile phone-based organizing tactics, using Facebook, Twitter, Web sites, email, cell phones and SMS and the full suite of Web 2.0 tools as mechanisms for political organizing. This is has all taken place in a highly restrictive media environment in which the Internet and other forms of digital communication are intensely regulated. Facebook has been blocked and unblocked several times in the past year. The rationale and legal justifications for censoring Internet communications are broad. Anything construed as anti-Islamic or damaging to the Iranian state can be blocked by what amounts to executive fiat, although there are many voices within the institutions charged with blocking web sites in Iran. Earlier reports that the government shut down the Internet entirely during the June 12 elections appear to be exaggerated. Jim Cowie at Renesys looked at the evidence from international routing data and indeed found evidence of some strange events in Iran’s traffic to the outside. However, the Internet is still up in Iran, though reports from inside Iran suggest that it is much slower than normal and a broader range of websites are being blocked. The fact that Iran has invested so much in blocking Internet content might mean that they have greater confidence about keeping tight controls over content available in Iran without shutting down the Internet entirely, as Burma had done in the face of popular protests there. After a large surge in SMS traffic in the run-up to the election, multiple sources inside Iran reported that the country’s SMS networks went down just nine hours before the polls opened. This is unsurprising, as SMS has been used in many places as a powerful tool for organizing protests. Reporters Without Borders reports that the SMS take-down was part of attempt to prevent opposition supporters from collecting election results. By Saturday, all mobile phone services had been shut off in Tehran. Plans by an organization led by former president Rafsanjani to carry out election monitoring using cell phones might have factored into this decision. Cell phone service was restored on June 14, but SMS continues to be blocked. Western media sources have covered the news as it unfolds, although some US media outlets have been criticized for not focusing more attention on the events in Iran. The government has not thrown western journalists out of the country, though it has made reporting difficult. The BBC has traced the jamming of one of its satellites, which has interrupted access to radio and television for audiences in Iran, the Middle East and Europe, to a location inside Iran. Despite the tightening restrictions on communications tools, citizen journalists inside Iran have been hard at work. 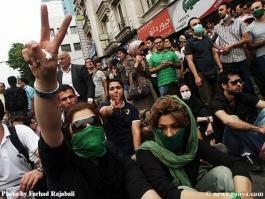 Video clips are widely available on the net, as are photos of Iranian voters and post-election protests. Although YouTube and DailyMotion are both blocked, we were able to upload a small video to Vimeo. The generally slow Internet speeds will hinder the upload of large files. ONI has confirmed the expansion of blocking over the past several days, making access to ongoing reporting of events as well as political organizing far more difficult for Iranians. In the past several days, YouTube, Twitter, and Facebook have been blocked. The English version of BBC is now blocked; the Persian version has been blocked for months. Websites of the major opposition candidates are all blocked, including Mousavi’s website mirhussein.com) and Karoubi’s website teribon.com). The blog host, blogfa.com, has been down for several days now, preventing many Iranian bloggers from updating their blogs. We tested the thirty web sites that receive disproportionate attention from the reformist segments of the Iran blogosphere and about half of these are not blocked, including norooznews.ir, webneveshteha.com, emruz.biz, emruz.info, yaarinews.com, mowj.ir, maryamshab.blogfa.com, mirhussein.com, masoudbehnoud.com, drmoeen.ir and noandish.com. Among those not blocked include ghalamnews.ir, aftabnews.ir and khatami.ir. (Thanks to John Kelly for the list of sites that we tested. This is derived from the blogosphere mapping work of John Kelly and Bruce Etling). Many years of Internet filtering have prompted the development of circumvention tools by and for Iranians. Many Internet users in Iran have become adept at getting past the Internet censors there. An unintended consequence is that there are many sophisticated users and tools that are prepared to circumvent government attempts to limit access to online sites. This increase in filtering associated with the elections can be expected to increase the demand for access to and knowledge about circumvention technology. These measures to further limit access to information around the contested election results are not going to help the current the Iranian government if it seeks to build legitimacy. Based on our monitoring of the Iranian blogosphere on election eve, it looks like Mousavi has broader support in the online blog community than Ahmadinejad. 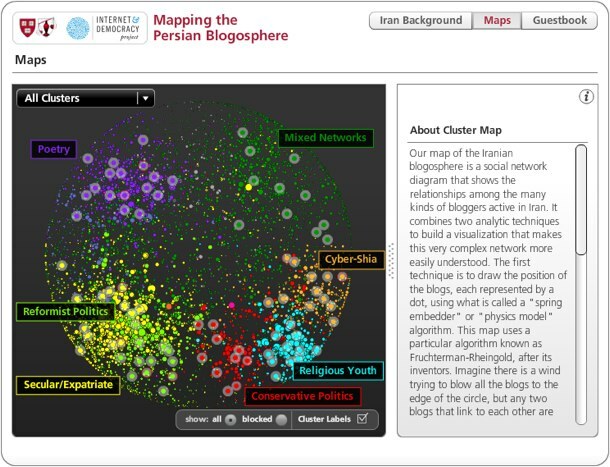 (For a broader understanding of the different attentive clusters in Iran check out our new online interactive Iran blogosphere map). The below maps show who is linking to websites associated with the candidates. It’s pretty interesting to see the contrast between Ahmadinejad emtedadmehr.com), whose links are very concentrated in the Conservative Politics cluster, and Mousavi mirhussein.com), whose links come from all over the map, not just the reformist politics group. We are particularly struck by how many links come from the poetry cluster, which rarely links to political sites. Also, Moussavi has even more links from the CyberShi’a than Ahmadinejad. This online interest doesn’t necessarily translate to the offline world, but it may indicate a broader level of excitement about Mousavi in the electorate, particularly among those outside his expected base of supporters, which could ultimately lead to higher voter turn out for Mousavi. As Hamid Tehrani wrote earlier this week, YouTube is being used a lot by Iranians in this election. Here is one of the YouTube videos most linked to by reformists. And here is the video most linked to by conservatives, which Hamid pointed to earlier in the week as an example of conservatives trying to discredit Khatami, who has supported Mousavi since he dropped out of the race himself. Iran experts caution against trying to predict election winners Iran (because we’ve been surprised before), and we’d caution against predicting a Mousavi win just on this analysis, but it is certainly interesting to see the larger level of online support for Mousavi on the eve of the election. We’ll have to leave it to the voters at this point. Some additional data and analysis on Iran’s election eve blogosphere is posted on Morningside Analytics Shifting the Debate blog. You can also catch an interview and find all of Hamid Tehrani’s posts on the Internet and the Iranian election on the PBS Web site. Check back here next week for the big release of our Arabic blogosphere paper and accompanying event at USIP. For us the Internet is like the air force in a military campaign. It bombards the enemy’s positions and lays the groundwork for the infantry, our volunteers, so that they can win battles on the ground. Minus the military analogy, this is not dissimilar from what we heard from the Obama campaign last year. The Iranian Presidential election will take place this Friday, and YouTube has been used both by Iranian citizens and politicians as a dynamic instrument during the campaign. Here, I would like to share a few examples to illustrate how YouTube has become a vibrant, interactive medium of expression in the hands of Iranians. 2. Demands beyond candidates’ campaign platforms: Rakhshan Bani Etemad,a leading female director, made a film where various women activists talk about their own demands. 4. Discrediting the Opposition: There is another YouTube film that targets former Reformist President, Mohammad Khatami, who is campaigning for Mousavi. A couple of hundred Azeri students held a protest against Khatami for making this joke, and asked Mousavi, who is Azeri himself, to condemn Khatami. Meanwhile, Khatami has claimed the film is a fake montage. 5. Campaign Events: Mehdi Karroubi, former Speaker of the Parliament, and his supporters forcefully broke through the gates of Amir Kabir University when he was banned by university authorities from delivering his speech. 6. Campaign films: Candidates promote their own campaign films on YouTube. Ahmadinejad’s supporters published dozens of films to promote his campaign. 7. Get Out the Vote: Iranians in 25 cities around the world came together to encourage people to vote. 8. Citizens in motion: Candidates’ supporters are dancing and celebrating each night after each presidential debate. 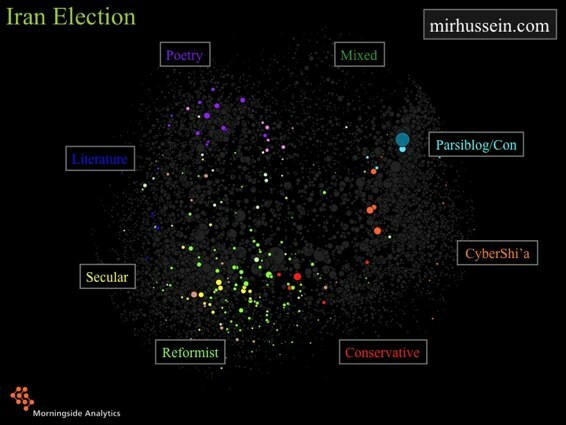 The Internet and Democracy Project team is excited to announce today that we’ve officially launched an online interactive version of our classic study on the shape of the Persian blogosphere that we published earlier last year. 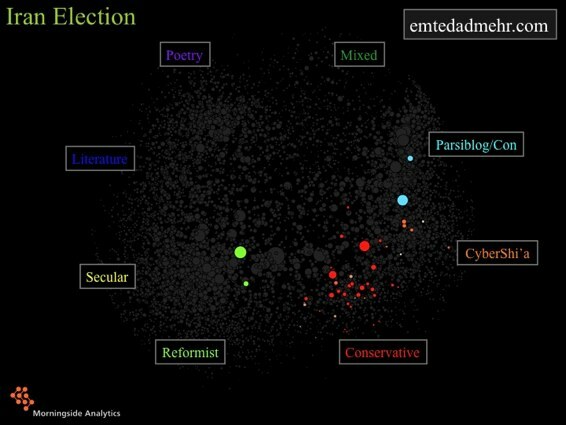 The tool allows users to easily sort through the data that we’ve collected on discourse networks in Iran, and explore some notable features of the online blog landscape. 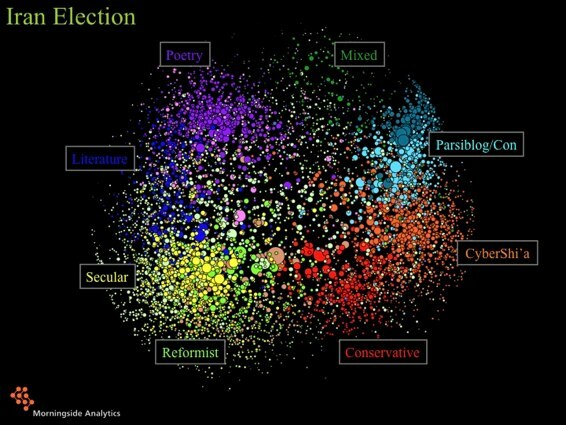 The map reveals the clustering of certain types of blogs, and reveals the content make up across the web as a whole. It’s now live, and totally fun to play around with. Check it out now.